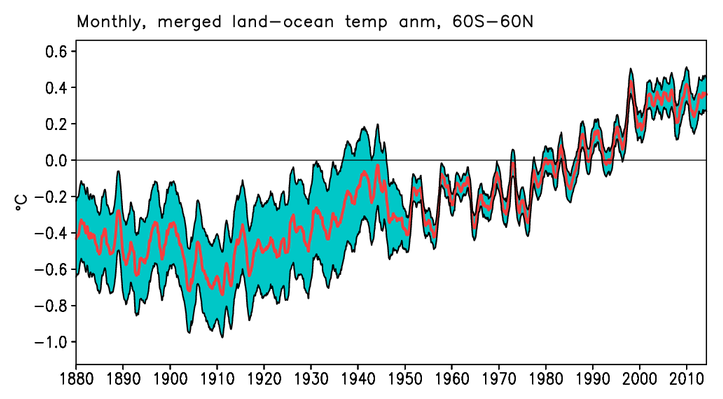 A monthly, merged land-ocean temperature anomaly graph from 60S-60N and 1880-2014. The historical Merged Land-Ocean Surface Temperature Analysis (MLOST) is derived from two independent analyses, an Extended Reconstructed Sea Surface Temperature (ERSST) analysis and a land surface temperature (LST) analysis using the Global Historical Climatology Network (GHCN) temperature database. The data is merged into a compilation for monthly global surface temperature dating back from 1880 to the present, updated monthly, in gridded and timeseries formats. The changes from prior versions include improved tuning procedures, processing sea ice bias correction directly from ERSST, and the addition of satellite data. This data set is used in climate monitoring assessments of near-surface temperatures on a global scale. Cite dataset when used as a source: Huang, B., T. Smith, J. Lawrimore, H.-M. Zhang, Merged Land-Ocean Surface Temperature, v3.5 [indicate subset used]. NOAA National Climatic Data Center. doi:10.7289/V5Q23X5V [access date]. Data access for monthly and annual land and ocean temperature time series are available from 1880 to present for several zonal bands using HTTP. The AMS Journal of Climate website for the scientific paper describing NCEI's MLOST data set (May 2008). The AMS Journal of Climate website for the scientific paper describing NOAA's Merged Land and Ocean Surface Temperature Analysis (MLOST), version 3.5. Purpose For scientific research and assessment on global surface temperature climatology. For a complete description of use limiataions for this data set, see the associated documents. Lineage Statement The Merged Land and Ocean Surface Temperature Analysis (MLOST) combines a global sea surface (water) temperature (SST) dataset with a global land surface air temperature dataset into this merged dataset of both the Earth land and ocean surface temperatures. The SST dataset is the Extended Reconstructed Sea Surface Temperature (ERSST) version 3b. The land surface air temperature dataset is similar to ERSST, but uses data from the Global Historical Climatology Network Monthly (GHCNM) database. The data were produced by and are archived at the NOAA National Centers for Environmental Information (NCEI). Merged Land and Ocean Surface Temperature Analysis (MLOST) combines Extended Reconstructed Sea Surface Temperature (ERSST) version 3b and data from the Global Historical Climatology Network Monthly (GHCNM) database. This is the DOI landing page for the ERSST source data. Description of Source: The sea surface temperature data was provided by the latest Extended Reconstructed Sea Surface Temperature (ERSST) verson 3b. This is the DOI landing page for the GHCN source data.